Saint Paul, founded in 1854, is a beautiful city. On the banks of the Mississippi River, it is a city unique geographically for it is only here that Mississippi forms a crescent as it flows southward. The heart of Saint Paul is surrounded by bluffs and hills, and it is because of these features that as the city grew outward, and upward, distinct and separate neighborhoods grew. The Cathedral Hill neighborhood is one of those unique places. By the late 1800’s the “Hill”, and nearby Summit Avenue with its great mansions, was the center of high society in Saint Paul. In 1907 construction began on the great Cathedral of Saint Paul which would overlook downtown and the river valley. Its first mass was held in 1915. The Hill neighborhood flourished thru the Twenties and Thirties. Mentions of it appear in the writings of F. Scott Fitzgerald, who for a time resided at the Commodore Hotel and on Summit Avenue. After World War II, life on Cathedral Hill changed, the neighborhood began to decline. The Seventies brought new life and appreciation for Cathedral Hill as a generation of urban pioneers fell in love with this faded neighborhood. Hundreds of homes and many buildings have since been restored. One of the earliest restorations occurred with the Dacotah Building and its now regionally famous W.A. 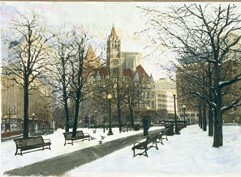 Frost & Co. restaurant which opened in 1975, both are featured in this painting. Just beyond “Frosts” is Paper Patisserrie card and gift shop. 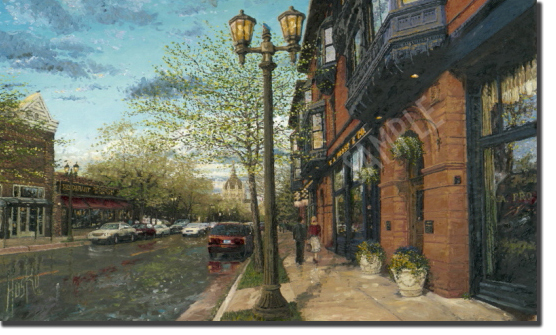 Across the street, Moscow on the Hill restaurant, in the distance rises the Cathedral, and beyond is a glimpse of downtown’s First National Bank Building.